Jo is currently a freelance writer and author of John Paul II. She has worked as a journalist in Asia, Europe, and the United States, and as a corporate writer on Wall Street. She is the recipient of the Carl Duissberg Gesselschaft-Journalists in Europe Fellowship Award to write about European Community affairs in Paris, France. She is a cradle Catholic who left the church for several years, returning to Catholic practice in 1995. During her years as a non-practicing Catholic, she explored various religions and spiritual traditions, including New Age, Buddhism and Hinduism. Jo received her BA in Communication Arts from De La Salle University in Manila, Philippines, where she was born and raised. Studying the life and work of Pope John Paul II, she states, played a critical role in her return to the Church. Jo is a work-at-home wife to Keith and mom to three-year-old Anna Maria. In her spare time, Jo loves to play with Anna Maria and Keith, and to have friends over for meals. 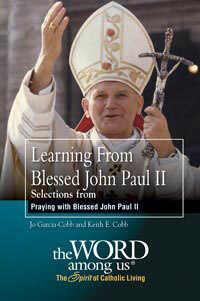 The three meditations in this booket are designed to assist your journey into a deeper prayer life with the example and guidence of this beloved pope and fellow pilgrim. Learn from the Holy Father about prayer and its relationship to our mission in the world, about saying yes to God without fear, and about being open to the action of the Holy Spirit in our lives.